I have been wanting to try some new skincare bits for a while now, I am huge fan of a skincare routine and have trying hundreds and hundreds of products over the last 15 years so when an e-mail dropped into my inbox mentioning Sukin Skincare I was all over it! I had heard of Sukin Skincare a few before this e-mail appeared, mainly from one of my best friends who lives in Oz, uses the brand and LOVES it and also from YouTube babe Brittney Saunders who has mentioned it in a few videos I've watched. 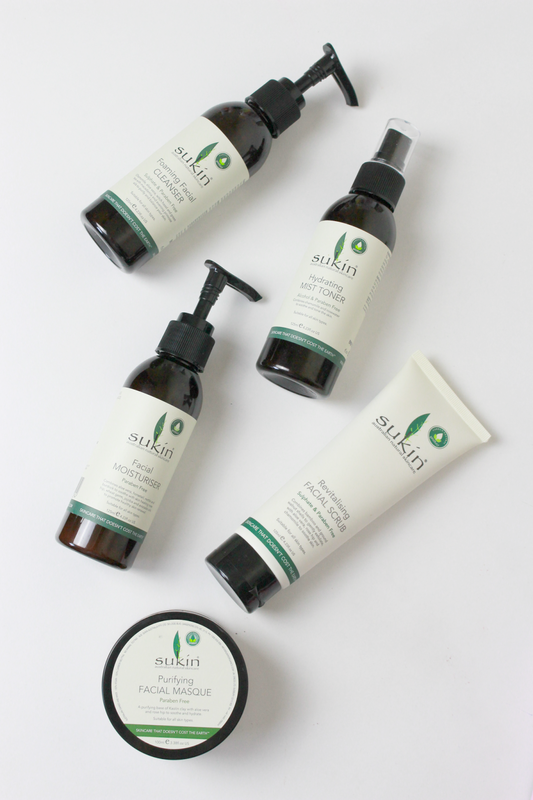 I mean you've probably now guessed already but Sukin is an Australian skincare brand and since launching in 2007 they have actually grown to be Australia's number one natural skincare brand! 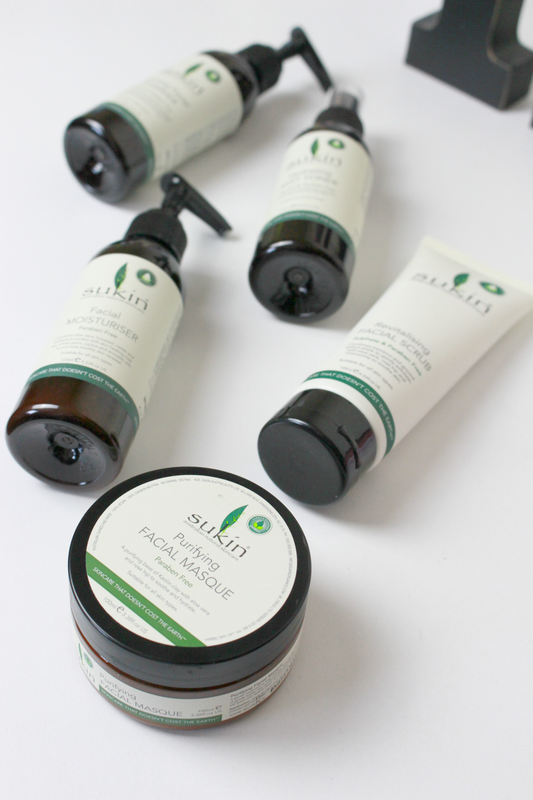 Their well-known tagline 'skincare that doesn't cost the earth' promotes not only their stance on affordability but also their natural and earth friendly ethos. All of Sukin's products are made with ingredients that are naturally derived, cruelty free and vegan - which sold me completely! I've been trying a full skincare routine from Sukin for the last few weeks and I thought what a great time to share my first impressions of the brand and the products I've been testing! This is a product I use every single morning. I keep it in the shower and use it as part of my morning routine when getting up and ready for work! This cleanser is a gel formula that foams when in contact with water. I dampen my face and use between half a pump and one full pump of product to gently cleanse my face in small circles. This wash is sulphate free and is made from ingredients such as chamomile, aloe vera, witch hazel and green tea - all great for calming and balancing your skin. This leaves my skin funky fresh, soft and really helps to wake me up! Thumbs up! I'm addicted. I cannot stop using this stuff. I love a good toner and after using Liz Earle's Skin Tonic for years I've struggled to find anything I like just as much. Sukin's Hydrating Mist combines rosewater and chamomile to create a soothing, calming and alcohol-free toner to use as and when needed. This is the perfect product for me working at home. I never normally have to wear make-up throughout the week unless I have a meeting so this is the perfect product to spritz on my skin throughout the day when I'm feeling tired, stressed or clammy. It has been a god-send throughout this hot weather... I've even been trying to make my boyfriend use it! This is probably my favourite product out of the five! I have always had problems when using moisturisers and there are only a few out there that my skin likes. Using strong, heavy creams usually breaks me out, I don't know what it is but my skin just doesn't like anything too 'cloggy'! This moisturiser is really hydrating but also fast-absorbing. It melts into the skin quickly and has a nice calming scent. For me this is a product I can only use once or twice a week instead of daily, as recommended. My skin unfortunately cannot handle it every single day but it's a lovely treat to massage into my face and neck every few days - I do love a bit of facial massage! I'm quite fussy when it comes to scrubs. I don't like gentle scrubs that feel like they aren't doing anything and I hate anything too overly abrasive where my skin feels like it's being rubbed off! This however is FAN-blommin-TASTIC. I've been using this a couple of times a week and have fallen in love. It has my skin feeling refreshed and smooth - definitely one to try this summer to help keep that tan on fleek! Oh god I do love a face mask, they are my guilty pleasure - I would do one every day if it was acceptable. *Announcement* ... I've become a proper beauty blogger now guys..... I applied this with a brush, a brush!! A mac brush to be precise... I know, I'm so fancy. Made with kaolin clay, aloe vera and rose hip oil this mask has been made as gentle treatment to help cleanse, tone and de-stress the skin, which is exactly what I need at the moment! This mask had me looking like Patrick from Spongebob, literally. It's a pinky/salmon colour and I literally look like a sunburt starfish walking round the house! After around 15 minutes I washed it off with warm water and a muslin cloth and I was left with soothed skin that looked not only calmer and refreshed and vibrant. IF you have sentisive skin and react to harsh face masks then this is deifitley one of you. It's so gentle but has fantastic results, I highly recommend. So all in all - I am LOVING Sukin Skincare. My skin looks great , bright and clear and the message from the brand a swell is something I can really get behind. I love using natural products and I'm really pleased they have started to take over in the beauty industry! I now have a long list of Sukin products I want to add to my collection... including the body lotion my bestie says is brilliant!